Krishna is a 40 year old finance professional working with a private firm. His family consists of his home maker wife and two young children. A couple of years back, an article in a magazine made him aware of the importance of medically insuring himself and his family. This prompted him to buy a family floater policy with an annual sum insured of 4 lakhs on which he pays a premium of around 15,000/- per annum. He was pleased with his decision of having adequately provided for any unforeseen medical emergency. A recent incident set him thinking on whether his existing cover was really adequate. A colleague of his was hospitalized due to some sudden medical condition, which took a serious turn requiring intensive care and monitoring and a prolonged stay at the hospital. By the time he was declared stable and discharged from the hospital, he had run up bills of around 9 lakhs, of which hardly 50 % was covered by his health insurance, the rest has to be borne by him personally. While this episode made him realize that his medical cover was not sufficient, a little research told him that doubling his cover would also mean shelling out at least double the annual premium too, which would put a considerable strain on his finances, given that he already had liabilities to pay. So, what is the way out in a situation like this where one realizes and wants a higher coverage, but the annual premium is not affordable? Here is where a top up mediclaim would come to the rescue. Scenario 1 : He is hospitalized and the bill is Rs 11 lakhs – 4 lakhs is paid from his mediclaim policy, and the balance of 7 lakhs is paid from the top up plan. Hence he gets full reimbursement. Scenario 2 – He and his wife both incur hospital expenses of 3 lakhs each in the same policy year – The existing mediclaim would pay 4 lakhs totally but the balance of 2 lakhs would have to be borne by him. Top up will not help here, as it gets triggered only if a single bill crosses 4 lakhs, and would pay whatever expenses are incurred above 4 lakhs in a single hospitalization. The biggest advantage is the huge medical coverage at an affordable cost. In the above example, If Krishna opts for a top up of Rs 10 Lakhs, it would cost him around Rs 6000 per annum- he gets an additional of more than double the existing cover for his entire family for less than half the additional cost. Another advantage is that the top up premium does not increase with the age of the insured, and once taken is fixed till the policy is renewable, which is usually till age 65. This is unlike the standard health insurance, where there are age slabs and the premium increases as the insured moves to a higher age bracket. No medical tests are required to be done till age 55 for a top up policy. The upper age limit for a no medical test for a standard health policy is 45 years. The only drawback of these policies is that it gets activated only after the specified limit is exhausted. Even if the family runs up multiple bills in a policy year and all of them individually are below this limit, nothing would be reimbursed by this top up policy. Given the skyrocketing medical costs and rise in health ailments, a top up plan is a good way to get an additional health cover at a nominal extra cost. 1) At the time of Hospitalisation do you have to inform both the Insurance Companies about hospital admission? 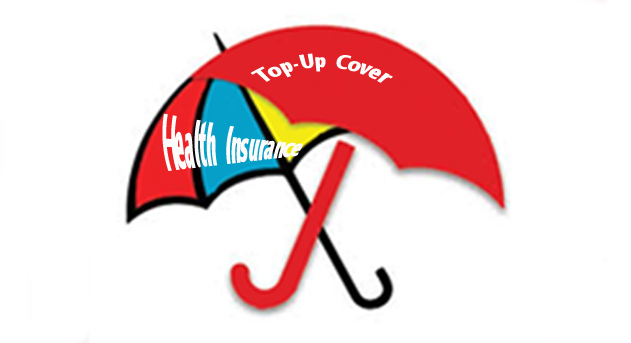 2) While buying a top up plan from a different Insurance Company, Do I have to inform the first Insurance company ? 3) Top up policy… are they cashless or I have to get it reimbursed? they might have, on the form. Thank You, for your comprehensive reply. Iam 61 yrs old & my wife is 56. I already have Max Bupa Gold Policy for 5 Lacs ( total) for two of us. Iam looking for a top up mediclaim policy for 05 more lacs. Could you kindly suggest some ? Almost all health Insurance companies offer top up plans.. the coverage and premiums too are not too different..and the premium depends on the top up cover, and not on age. So whether you are 30 or 60 years of age, the premium is the same, unlike the basic health paln where it increases with age. I presume it should be somewhere in the range of 3000-4000 per annum for you and your wife, together. If you are based in Mumbai, I can get this executed for you, else you could contact any health provider in your city. Thanks. Thanks, Annapurna… … for clarifying my doubts…Iam Bangalore based..